Food Costs > How Much Does Zucchini Cost? How Much Does Zucchini Cost? Zucchini is considered to one of the easiest things to grow and will provide you with what seems like an endless supply. If you do not want to grow it yourself and want to purchase it at a local store, the costs will depend on the store, the time of year, and the size of the vegetable. For example, FoodCoop.com, a coop pricing website, claims that the average price should be around $2 per pound. 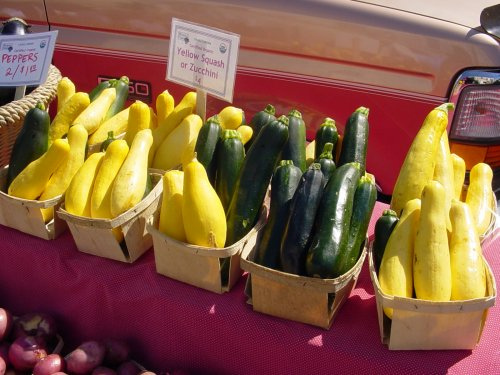 Zucchini often found in a grocery store can often package it in little foam-trays and cover with plastic paper wrap. Otherwise, it will be out in the open, where you can pick and choose which one you want to take home, similar to most other vegetables. On average, a zucchini, also referred to as a summer squash, is going to be around eight inches in length; however, some can grow as large as three feet. The zucchini matures at eight inches and can be picked any time after. For every 100 grams, a zucchini has 15 calories. It also contains a healthy amount of folate, potassium, omega-3 fatty acids, manganese, vitamin A and C.
When choosing one at a local store, look for one that’s slightly prickly and a shiny skin. The skin, when examined, should be firm and free of cuts and bruises. Zucchini bread is a great way to use leftover zucchini. When sliced, the average medium-sized zucchini can yield close to one cup. Every pound can yield close to three and a half cups. To store freshly picked zucchini, wrap it in a plastic bag and store in your refrigerator. This bag should be loosely tied, not sealed, and if done properly, it can last up to one week. If freezing, pat it dry, trim off the ends and slice it crosswise into 1/4-inch sections. Then, place into a storage bag designed for freezer storage. Is zucchini truly a vegetable? In a culinary context, yes, it’s treated as a vegetable, but botanically, zucchinis are referred to as a fruit due to the berry, known as a “pepo,” which is the swollen ovary of the zucchini flower. Try to buy zucchini during the peak seasons during the summer months. Keep your eyes peeled for special promotions and sales at your local store. Ask your neighbors. If they have a garden and they grow it, you may be amazed at how much they probably have.